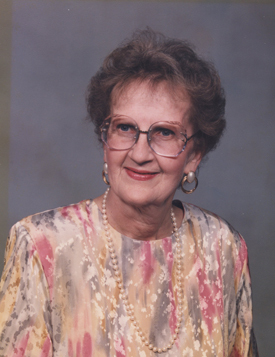 Delores Marie Anderson-Engen, age 84 of Cannon Falls, died peacefully on Thursday, April 4, 2019. She was born April 2, 1935 in Superior, WI to Archibald Wilhelm and Myrle Marie (Soderlund) Johnson. Delores attended Wentworth Elementary and Northwestern High School in Poplar, WI. She was united in marriage to William (Bill) Anderson on August 25, 1956 at Peace Lutheran Church in Wentworth, WI and the two made their homes in South Range, WI, Duluth, MN, and Red Wing, MN before settling down in Cannon Falls, MN. They built a home together in Cannon Falls in 1970 where both were active members of the community. In the early years of her marriage, Delores was a stay-at-home wife and mother. She was a favorite amongst the neighborhood kids as she always welcomed others into her home. The fresh baked bread waiting for them when they got off the school bus certainly made her home more inviting! When her kids were older, Delores attended the University of River Falls, WI to obtain her college degree in K-6 education, graduating in 1968. She spent a year teaching at St. Joseph Catholic School before joining the Cannon Falls School District as a beloved teacher and respected colleague. Delores taught 5th grade for one year and then 3rd grade until she retired in 1997. She was known as the “Grandma Teacher” as every time she walked down the hall with her own class, one of her grandchildren would yell out “Hi Grandma!”. Delores shared her gift of teaching outside the walls of the school including teaching Sunday School, leading youth groups and Bible study, teaching her children and grandchildren how to cook and bake. She was active in the Red Hat Club, WELCA, book club, and loved to dance, camp and travel. But what she enjoyed the most was watching her grandchildren grow to adulthood and attending many of their recitals, concerts, plays and sporting events. Perhaps her greatest joy was watching her great-grandchildren play and be able to read to them. Delores later married Edward “Bud” Engen on December 17, 1998 in her home in Cannon Falls. Together they built a home in Austin, MN where she lived until 2014 when she moved back to Cannon Falls and resided at Twin Rivers Senior Campus. She enjoyed watching Bud work around the farm, visits with his family and drinking coffee on the decks in the mornings. She was also known to feed stray cats and other animals who came by for a visit. Delores is survived by her children: Lynne (Mark) Berg, Cannon Falls, MN; Greg (Tania) Anderson, Post Falls, ID; Doug (Anne) Anderson, Cannon Falls, MN; and Rick (Lynn) Anderson, Waupaca, WI; her brother Rodney Johnson of Coraopolis, PA; 19 grandchildren, 18 great grandchildren; step-daughters from her second marriage: Julie (Chuck) Naatz, Blooming Prairie, MN and Judy (Randy) Jacobson, Niceville, FL as well as many additional extended family members who she loved and shared many happy memories with. She is preceded in death by her parents, husbands William and Edward, brother Warren Johnson as well as several brothers and sisters-in-law. Visitation will be at Lundberg Funeral Home in Cannon Falls on Thursday, April 11 from 4-7 p.m. with services held at St. Ansgars Lutheran Church, Cannon Falls on Friday, April 12 at 11 a.m. with reviewal one hour prior. Memorials are preferred to either St. Ansgars or St. Olaf Building Fund (Austin, MN).